By reading this email you acknowledge you have read our disclaimer provided as an image near the bottom of this email or the link included. This is a paid News Dissemination Advertisement. FN Media Group is not responsible or held liable for the information in the email or any included press releases issued by any public company contained herein. Please be sure to ALWAYS perform your OWN Due Diligence. To stop receiving our news alerts and immediately Remove yourself from the FNM online community, please scroll down to the bottom of this message and use the links provided. FinancialNewsMedia.com (FNM) is a leading provider of top tier Market Updates & News Alerts for evolving companies on the move. FNM Alerts never contain hype, over promotion, predictions or personal opinions - just true Time Sensitive News Alerts that are 100% News Driven. TAMPA, Fla., January 12, 2016 /PRNewswire/ -- MagneGas Corporation ("MagneGas" or the "Company") (NASDAQ: MNGA), a leading technology company that counts among its inventions a patented process that converts liquid waste into MagneGas2® fuel, announced today that a major utility company that has been using MagneGas2® fuel for metal cutting, is expanding use of the fuel into multiple locations. As one of the largest electric holding companies in the United States, safety and productivity are of paramount importance. The utility has been undergoing a training and rollout program with MagneGas2® for several months at one facility and now wishes to expand the use of MagneGas2® into another two facilities. The second facility has placed their initial order and the third facility plans to begin the use of MagneGas in the next 90 days as supply is available. This utility company, as is required in the industry, each year shuts down its facility and replaces, repairs and/or refurbishes much of its steel and other parts made from various metals. In addition to its increased cutting speed and its ecofriendly attributes, MagneGas 2® has proven itself to be an efficient and cost saving way for this utility to limit the amount of down time required. 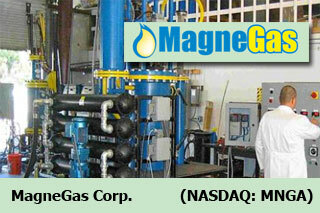 MagneGas Corporation - Founded in 2007, Tampa-based MagneGas Corporation (NASDAQ: MNGA) is a technology Company that counts among its inventions, a patented process that converts liquid waste into hydrogen based fuels. The Company currently sells MagneGas® into the metal working market as a replacement to acetylene. It also sells equipment for the sterilization of bio-contaminated liquid waste for various industrial and agricultural markets. In addition, the Company is developing a variety of ancillary uses for MagneGas® fuels utilizing its high flame temperature for co-combustion of hydrocarbon fuels and other advanced applications. Keep a close eye on your inbox for a future alerts and please feel free to constantly check the FinancialNewsMedia.com website for new announcements posted daily. You are currently receiving this message because you have visited, opted in or requested information from one of a many affiliated or associated financial sites. FN Media Group completely respects everyone's right to online privacy and wishes to only communicate to those who are interested in receiving premium news alerts for companies that issue real news with real developments. If you believe you have received this message in error or prefer to no longer receive our alerts, please use the unsubscribe link provided below to immediately remove yourself from our online investment community. FinancialNewsMedia.com is a news dissemination and financial public relations company that delivers breaking news alerts and market commentary updates to the investment community. This complimentary news service is viewed by hundreds of thousands of retail investors from around the globe that frequent other popular online news & financial destinations such as TradeKing, Forbes, CBSMarketwatch, Morningstar, Bloomberg and so many more.